In my last blog, I broke down the New “Old School” vs. the “New School” Preschool Program. 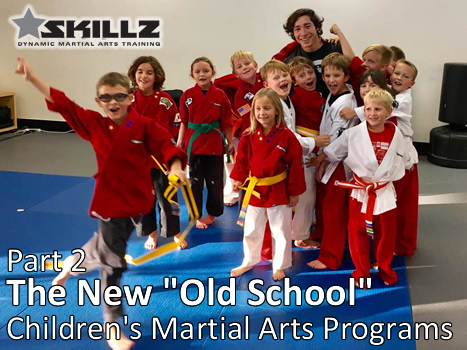 I mentioned that I started training in the Martial Arts back in 1987 when it was common for most Martial Arts schools to combine kids and adults into one class. Starting in the 90’s we saw children get their own classes, and entering into the millennium, we saw those classes sub-divided into 6 and under classes and 7 to 12-year old classes. Today, you are considered “new school” if you divide those programs down even further to target children’s stages of development even more. With that said, in this article, I am going to break down the New “Old School” vs. the “New School” Children’s Programs. To take this even further as it pertains to the 13 and up adult program, the least amount of enrollments are drawn from the 13 to 14-year old age bracket, mostly because young teenagers do not want to train side-by-side with adults. It’s no wonder why schools running these programs are constantly feeling like they are playing “catch up” when trying to attract new students. You are working with second graders side-by-side with seventh graders! On top of that, eight graders are trying to find their own independence from adults and therefore have absolutely no desire to partner up with someone old enough to be their parents! At the same time, 13 and 14-year olds are amazing athletes that typically love Martial Arts, so it’s an age group that should be prominent within any Martial Arts school. If you take the “New School” approach and split your classes up according to these age brackets, you now have classes that are dynamic, exciting, and easier to retain. You can now target your 7 to 9-year olds stage of development with a program that progressively builds their skills without having to worry about the older kids being bored. Your curriculum has more difficult challenges for the higher-ranking students, but the challenges are not beyond their physical, intellectual, emotional, and social capabilities. At the same time, your pre-teens and young teens all get to train side-by-side with peers that they understand. They are not being “slowed down” by younger students, and at the same time the lower-ranking students see their potential by watching their higher-ranking classmates perform, versus being over-shadowed by adult classmates. Classes are not only fun for the students, but the instructors as well because they are not experiencing the daily “roller-coaster” ride that the new “Old School” programs deal with each and every day. Now, I know it’s hard to make changes, especially when you are use to one system. Many people fear change will cause existing students to drop out, and at the same time be a management headache to integrate new schedules, curriculums, and belts. Email me at melodyshuman@skillzconnect.com to receive a FREE selection of drills that target each age group. Seeing drills side-by-by that compare each age group can help instructors see the significant learning curve between them.